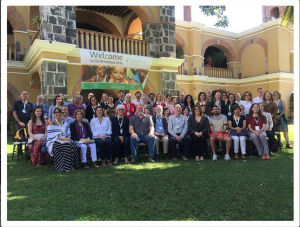 The International Society for Children’s Health and the Environment (ISCHE) held their second meeting from January 6-9, 2016 at the Hacienda San Antonio El Puente in Xochitepec, Morelos. At the meeting, global leaders in children’s environmental health research discussed ways to protect children from environmental risks, translate research into direct action, and build capacity for future research development. 55 researchers from 6 countries participated, bringing to the table a wide range of experience in the field. Mount Sinai P30 center members in attendance included Drs. Rosalind Wright, Robert Wright, Alan Just, Megan Horton, Annemarie Stroustrup, and Manish Arora. Dr. Robert Wright served as the retreat planning committee co-leader for this event. This entry was posted in Feature of the Month on January 10, 2016 by mountsinaitceee.